“Am I supposed to be retelling my creature’s story or confessing my own?” asks Mary Wollstonecraft Shelley, author of Frankenstein and the protagonist in Petaluma playwright David Templeton’s latest theatrical piece “Mary Shelley’s Body,” now in its premiere engagement at Sebastopol’s Main Stage West. 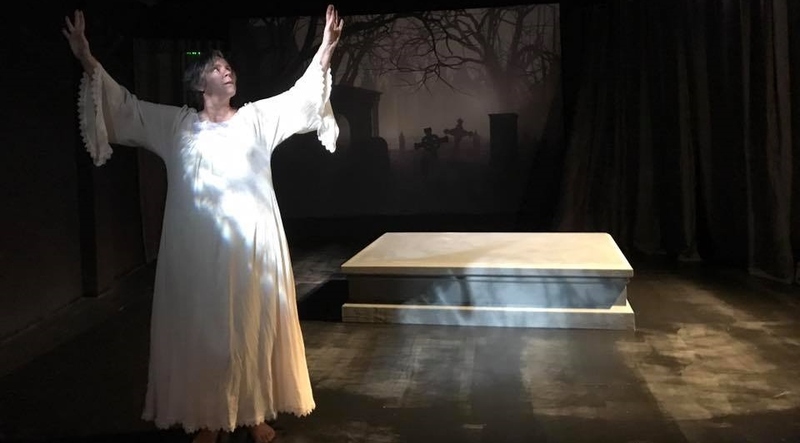 The play opens, as most good ghost stories do, in a graveyard where we find Mary Shelley (Sheri Lee Miller) atop her tomb and coming to grips with the realization that she is dead. She finds herself trapped by an invisible force and begins to review her life with the hope of revealing the reason for her purgatorial existence. Her upbringing by a stern father, her romance with the married Percy Shelley, their eventual marriage after the suicide of Shelley’s wife, and the loss of three of her children are all relayed, as well as the fateful summer evening spent in the company of Lord Byron and others where she conceived the idea for her classic horror tale. Interspersed with the biographical information is Templeton’s original take on the Frankenstein story, focusing on the “construction” of the monster. Four tales are told of the various parts collected by Victor Frankenstein — the hands of an ox man, the brain of a judge, the heart of a stallion and the blood of a washwoman. Each tale is a horror story unto its own and they provide the play with its strongest, creepiest moments. The play concludes with Shelley’s horrific realization as to how she met her demise, but to reveal more may reduce the jolt audience members deserve to receive for themselves. We’ll just say that in Templeton’s world, Shelley’s tale of Frankenstein may be more autobiography than fiction. Miller gives a tour-de-force performance as Mary Shelley, one moment exuding the charm of her character and in the next relating a bone-chilling tale of murder and body snatching. There is also a surprising amount of humor in the piece which Miller slyly delivers. She commands the stage from beginning to end of the play’s one hour and 45-minute run. The show could stand to be trimmed a bit, particularly with the sometimes-clunky exposition at the show’s start. There were also a few moments that left some members of the audience confused that could have been clarified. Templeton writes a good horror story, and Miller as Shelley is a great story teller. Both are aided by a simple but effective set design by stage director Elizabeth Craven and the omnipresent flashes of lightning and rumbles of thunder that surround the audience courtesy of designers Missy Weaver and Doug Faxon. Current events may make some shy away from a tale in this genre but the Main Stage West production of “Mary Shelley’s Body” really will transport you to another time and place.